Patriotic moment in Spain ahead of Nations League clash. England are set to face Spain in Seville on Monday night and the fans are already over there enjoying the atmosphere in the build-up to the Nations League match. 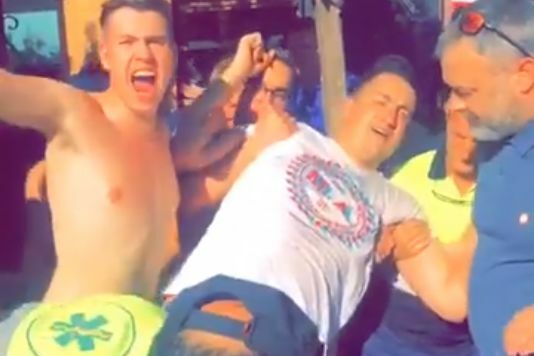 One group appear to have got particularly drunk and can be seen in this video singing God Save the Queen as one of their friends is loaded onto a stretcher after reportedly drinking a bottle of sambuca, although that seems to be subject to some debate. The man is thought to be a Shrewsbury Town supporter named Carl, who has since confirmed he’s feeling better now. The England fan sings along to the national anthem as he’s aided by the medical staff and police outside the bar before being taken to hospital.